Have You Seen Pumpkin on a Stick? Have you seen those pretty little Pumpkins on a Stick at Trader Joes and the farmers’ markets? 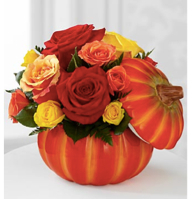 They’re the most beautiful fall decorations; simple and providing a look of warmth for the fall season, yet elegant enough to adorn the table at a fancy Thanksgiving dinner. Pumpkin on a Stick isn’t really a pumpkin (no, it’s not any type of gourd either, and it’s definitely not a tomato). It’s an eggplant! Who would have thought. This Pumpkin Tree or Pumpkin Bush, as some call it, has actually been delighting gardeners for more than 125 years and it’s recognizable as an eggplant by the thorns on the stick. The Pumpkin on a Stick plant has large purple thorns that dramatically jut out from sturdy, long-lasting branches. At first, the fruits on the branch are green (which may be why some think it’s a tomato) and then they turn a beautify scarlet shade. The eggplant/pumpkins don’t get their orange color until they begin to dry out. Whether you call this holiday favorite Pumpkin on a Stick, Red China Eggplant, Hmong Eggplant or Scarlet Chinese Eggplant (many of its names reflect its origins in Southeast Asia), just make sure it has a place in your home this year. Pumpkin on a Stick is an attractive plant that sits upright, reaching 3 to 4 feet, and it’s well-branched, filling a space of about 2 to 3 feet wide. Its gorgeous foliage protects the green-then-scarlet fruits from the sun. 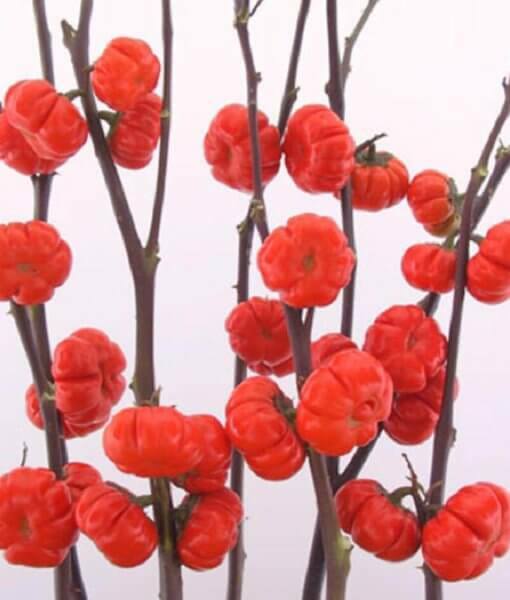 But, when you see the plant in the markets, you’ll likely find that the fruits are now orange and the stems look more woody and plain – stick-like. You can sometimes find Pumpkin on a Stick in live plant form. If you do, simply care for it by giving it an ample supply of water and food. If you purchase the plant cut, place it into fresh water and refresh liquid every other day or so. Have you seen Pumpkin on a Stick or purchased it this year? Do you know someone who would love to receive it as a gift? If so, feel free to let us know in the comments below.